“Roadmap” – seems a bit strong for our team. Do you have examples where other teams are using that? I wasn’t able to turn one up in my quick exploring. Was thinking of this area mostly as what are we focusing on right now, and what are we planning to eventually include. We’ve mostly started with user lessons and speaker training. Of course, including workshops here too will happen. Not seeing this as a super rigid thing, or mentioning dates. More like phases of work. We used to have a widget called “Current Focus” or some such thing. And we’ve been talking about yearly goals. Seems like a good place for that information. We have forms for getting started with the team and for providing feedback. Where would you see those fitting in? Just links on a page or a page for themselves? Get Involved> First steps, main Get Involved, and possibly right up front at the top of the team page in the infobox area. The Core Team has an interesting format for their handbook. 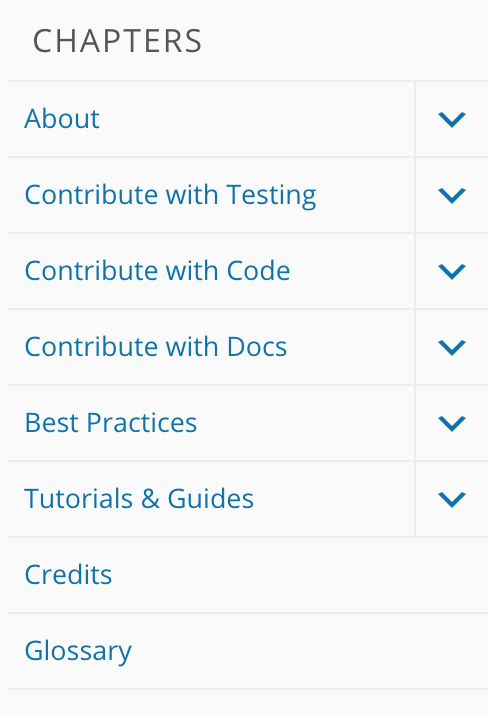 I like how the different ways to contribute are front and center. The Tutorials & Guides seems like a nice way to put that all in one place. What would be on the Learn WordPress site page(s)? Thoughts about changing “Communication” to “How We Work Together”? I’m good with the rename.